Plants annual. Culms 25-100 cm, erect or decumbent. Sheaths slightly compressed; ligules 0.6-1.3 mm; blades 6-30 cm long, 0.4-1.1 cm wide, adaxial surfaces glabrous or sparsely pilose. Panicles 4-15 cm; rachis internodes 0.8-1.7 mm; fascicles 5-8 mm long, 2-4.5 mm wide, imbricate, globose, villous at the base, tawny; outer bristles 5-25, the majority equaling or slightly exceeding the inner bristles but narrower and terete, arising in a whorl at the base of the fascicles; inner bristles 4-10, 2-4 mm long, 0.6-1.8 mm wide at the base, flattened, not grooved, erect or interlocking at maturity, fused for 1/3 their length or more, forming a globose cupule. Spikelets 2-3 per fascicle, 3-6 mm. Lower glumes 0.5-2.5 mm; upper glumes 2.2-4.9 mm, 3-5-veined; lower lemmas 3-5.5 mm; upper florets 3.6-5.4 mm; anthers 0.8-2.3 mm. Caryopses 1.9-2.6 mm long, 0.8-1.9 mm wide, ovoid. 2n = 34. Cenchrus brownii is native to sandy waste places and forest borders. It occurs infrequently on the coastal plain of the southeastern United States, but is common through the Caribbean, Central America, and the northern coast of South America. It has also been introduced to other parts of the world. 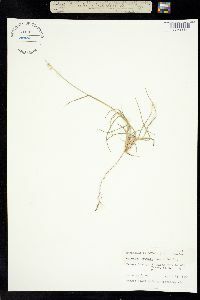 The record from Texas may represent an introduction; only one specimen is known from the state.